Say, “Hello” to a sense of community that can only be enjoyed on a small ship. The ultimate in intimate adventure travel in the Galapagos Islands, Celebrity Xploration is a stylish catamaran that features eight luxuriously cozy staterooms, each with a window or veranda to the world that offers personal views of this stunning destination. 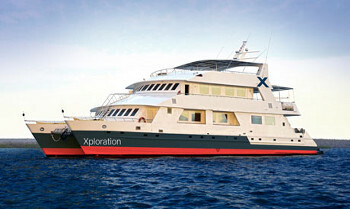 Aboard Celebrity Xploration, you’ll experience a once in a lifetime vacation through the Galapagos! Enjoy this intimate ship perfect for family get-togethers, small groups and getaways. Sixteen guests will be indulged with seamlessly intuitive service and every creature comfort possible. Celebrity Xploration features new itineraries with ports of call we’ve never before visited. Enjoy an Early Riser continental breakfast and lunch daily under the open air shade canopy in addition to specialty drinks and music. On special nights, enjoy Dinner Under the Stars. One of the most popular areas onboard the ship, the Sun Deck is ideal for whale watching, stargazing, or relaxing in the hot tub. Its relaxing indoor atmosphere is perfect for reading, watching a documentary, or having a cocktail. In addition, this is the area where most Naturalist briefings take place.